Spectacular Golf Course Homesite overlooking the prestigious 1st Hole Green of Glenmore. Incredible views of the 1st and 2nd Holes, as well as, views of the Rivanna River and the Equestrian Trails. Located within 500 yards of the Glenmore Clubhouse, the Golf Practice Area & Driving Range, the Swimming Pools, the Fitness Center and the Tennis Facilities. Welcome to Octonia Highlands! Nestled at the foot of the Blue Ridge Mountains in the beautiful South River Valley where nature and community are a lifestyle. Now offering quality built and upgraded designed homes for every style of living. Offering 5 models to choose from with abilities to customize or you can choose a home site to build your perfect custom home. Private retreat, 20 mins to zions, 35 mins to short pump and MJH, Gorgeous Stone facade. Sitting on majestic granite landscape. Listen closely to hear the "Riversong". Breathtaking view overlooking the Rivanna river. Great fishing, swimming, boating and hunting. This home boosts an Open floor plan, 2 sided fireplace to warm you on cold winter nights. 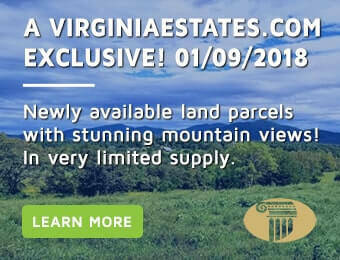 Welcome to Piney Mountain, Palmyra, VA. Be among the first and the few to live in Fluvannna County's newest large lot enclave of fine homes. The Radford, a 2 story with Craftsman flair AND a Flexible floor plan. Work with Meade Construction to create classic space and lifestyle. Fiber Cement Siding, Stone accents and inviting front porch welcome you home. 14+ acres with panoramic views of the Blue Ridge and Fox Mountains! Just 30 minutes to Charlottesville and 15 minutes to Crozet, this incredible property offers the perfect setting for your dream home or your vacation retreat. A unique property located just minutes from town with a building site on a bluff overlooking the Rivanna Reservoir and River with views of the Blue Ridge. Another building site can be found overlooking a lovely pond on the property. The bluff will be cleared as soon as the Excavator can get in there. Located off Woodlands Rd. on a private drive.